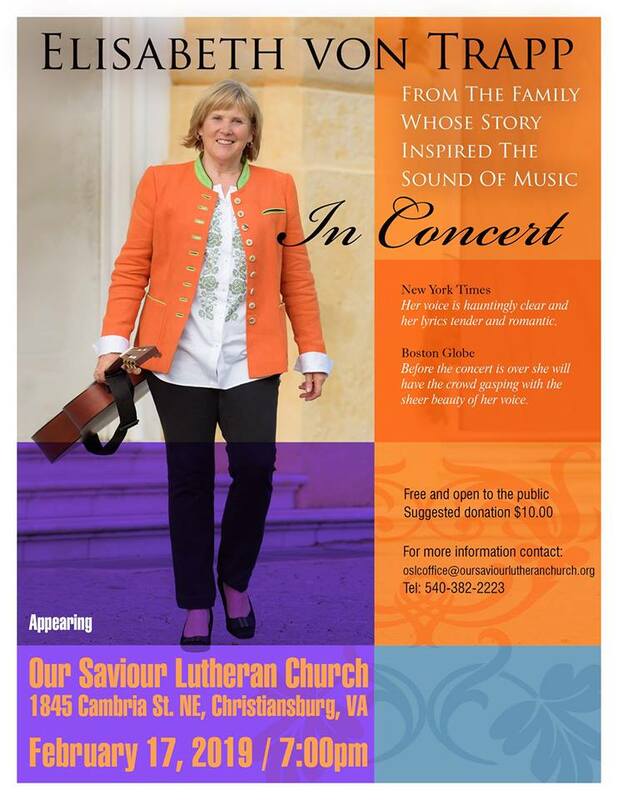 Our Saviour Lutheran Church presents Elisabeth Von Trapp in concert on Sunday, February 17, 2019. For Elisabeth Von Trapp, “ the sounds of music “ are part of her earliest memories. Born and raised in Vermont, Elisabeth is the granddaughter of the legendary Maria and Baron Von Trapp, whose story inspired The Sound of Music. Singing professionally since childhood, Elisabeth has enthralled audiences from European cathedrals to Washington D.C.’s Kennedy Center. Inspired by her father Werner Von Trapp’s guitar playing and singing, Elisabeth has carried on the legacy of the internationally renowned Trapp Family Singers. She began taking piano lessons when she was eight and by the age of sixteen she was playing guitar and traveling the back roads of New England performing with her siblings at weddings, gospel meetings and town halls. Elisabeths concert repertoire ranges from Bach to Broadway … Schubert to Sting. With equal ease and eloquence she sings timeless wonders like Rodgers and Hammerstein’s Favorite Things and Edelweiss, Lieder by Mozart, Puccini’s o Mio Babbino Caro, soaring gospel tunes, pop classics like a Whiter Shade of Pale and her own stunning compositions. Elisabeth has released five self produced albums, and has performed across the United States, Austria and Russia. her music has been featured on National Public Radio, BBC-Radio, Japanese national radio and CNN Spanish radio. She has appeared on CBS’s eye on people, ABC’s Good Morning America and BBC-TV. The concert is open to the public. Admission is free, however a $10.00 donation is encouraged. To view the event flyer, visit: https://i.imgur.com/xMd3tCJ.jpg. For more information, visit: http://www.oursaviourlutheranchurch.org/ or https://www.facebook.com/pages/Our-Saviour-Lutheran-Church-Christiansburg-VA/321268734643141 or call 540-382-2223 or email oslcoffice@oursaviourlutheranchurch.org.